Wall art print by Paintspiration. I have a confession to make. Thursday, November 29, 2018 marked my last class of my second-to-last semester. All I have left are six months before I graduate and can consider myself a fully-fledged adult. I am only five, maybe six, months away from fulfilling two of the above criteria. I’ve already, obviously (well, I say “obviously” though it might not be to you), graduated high school, and my plan is to become my own independent person once I no longer have to worry about college. I’ll move out of my dad’s house, get a place of my own, work. Probably work a lot, if my current trend is anything to go by. It’s the most terrifying and exhilarating experience I’ve yet to come across. As the months go by, I continue to imagine all of these little things that I can do when I live all by myself. Like not have to worry about waking up at 7 in the morning because my sister is getting up and about so she can go to school. Or like not feeling pressured to keep my personal space utterly spotless. I will get to decorate my place the way I want to, so that it fits my aesthetic. I won’t get interrupted during a writing session because of random house noises. I can eat a whole pint of Ben & Jerry’s without getting judged for it. Well. To be fair, no one’s judging me. They probably should. That ice cream is wickedly delicious and I can’t stop eating it. Please send help. Then I wonder if all those cool things are really all that good. Like, is it a bad thing that I feel pressured to keep my personal space clean? I mean, if my entire house is going to look like my room currently looks, I probably won’t be wanting to invite people over with any frequency. Controlled chaos is alright on a small scale. A bit less controllable on a larger one. I wonder, too, if I’ll be able to keep track of all the money stuff. If I’ll be able to fulfill my obligations. If I’ll work too hard or not quite hard enough. If I’ll be able to figure out how to dine without having the same dinner microwaved five nights in a row. If my cat will be unbearably lonely because I’ll be gone all the time. My point is, I’m not entirely sure what it means to be an adult. I’m afraid it’ll be like trying to fly and then in the end just crashing to the ground. There’s nothing wrong with living with your parents. I’ve done it throughout my college experience. I just don’t want to stay in my parent’s house. I want to live my own life, be my own person, prove to myself that I can do this. That I can make the world a better place while I’m at it. I can imagine that there’s no better feeling in the world than flying. Everything else is telling you that it’s impossible, that it won’t work, that the wings won’t hold. But it is possible. It does work. You soar through the sky like a queen of the air. It might be terrifying, but I think the flight is worth the risk. P.S. I realize that it’s December 1st, which means some of you — maybe even many of you — have survived another round of NaNoWriMo. If you finished, congratulations, regardless of word count. It’s the trying that matters. I’m proud of you, for whatever that’s worth. If you couldn’t make it, that’s okay too. Sometimes an idea is just doomed to fail, and it’s only through the trying to write it that you realize it’s either not going to happen or simply not quite ready. There’s always next year. There’s always a chance to try again. 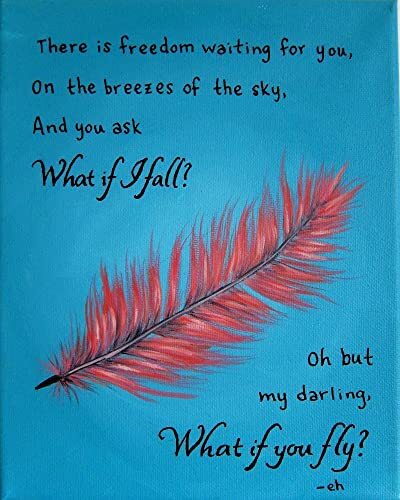 Posted in Shower ThoughtsTagged adulting, Erin Hanson, feeling good, flying, growing up, hope, life, What if you fly?